1 Blake Shelton “She’s Got A Way With Words"
2 Carrie Underwood “Church Bells"
3 Martina McBride “Just Around The Corner"
5 LOCASH “I Know Somebody"
6 Florida Georgia Line “H.O.L.Y." 7 Keith Urban “Wasted Time"
8 Chris Young (Feat. Vince Gill) “Sober Saturday Night"
9 Brad Paisley (Feat. Demi Lovato) “Without A Fight"
10 Dierks Bentley (Feat. Elle King) “Different For Girls"
11 Jason Aldean “Lights Come On"
13 Jake Owen “American Country Love Song"
14 Eric Church “Record Year"
15 Justin Moore “You Look Like I Need A Drink"
17 The Scott Brothers “Let The Night Shine In"
19 Brothers Osborne “21 Summer"
YSYE.net Your #1 Country station! 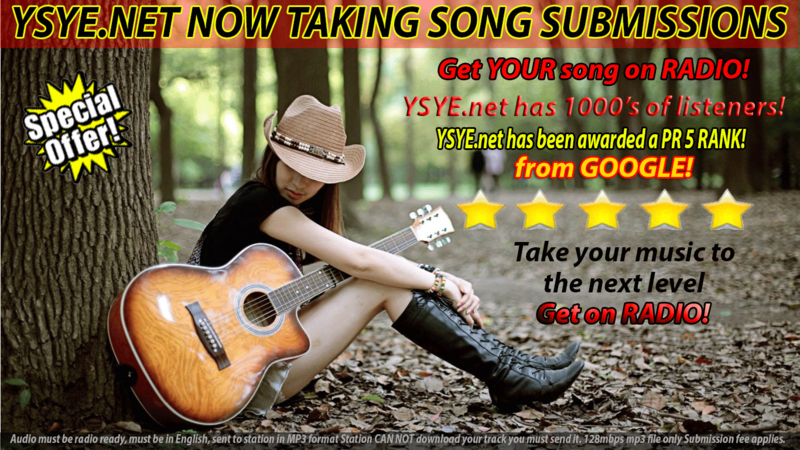 YSYE Radio is your station for NON stop HITS from the 90's an now! "LIVE" from studio 3 in Broadcast park. Cleveland Ohio.